My second resolution this year: lower my expectations. Image courtesy of the Accidental Executive. Ok, that doesn’t sound very nice, does it? Let me elaborate. When you hold high expectations for people, places, certain events, etc., you have a greater chance of disappointing yourself. In contrast, try not to set your sights too low. I can’t tell you how many times I missed out on an event, show, or party because I was “too tired” or “I can’t find parking”. In reality, I didn’t have the highest expectations and would make excuse after excuse to make myself feel better about not going. How do you know some thing is going to be wonderful or terrible if you don’t experience it? 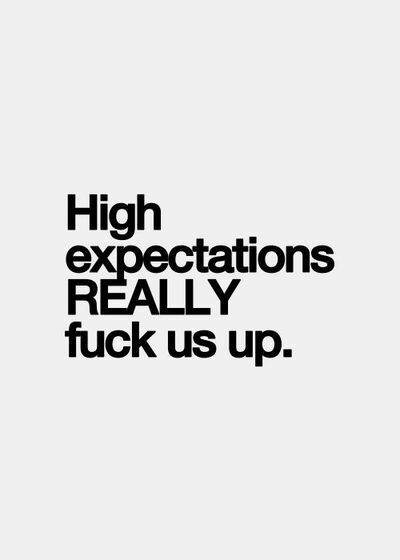 Instead of setting your expectations too high or too low (who are you Goldie Locks? ), clear your head, open your heart and embrace positivity. Go out into the world! Accept invitations, go on an adventure, and just see what happens!